That, sports fans, will get you from central London right to the Olympic Stadium. 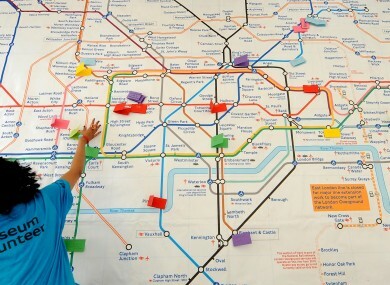 The subway system in the British capital has taken on a new look with Transport for London’s Olympic Legends Map. Instead of Picadilly Circus, Baker Street and Knightsbridge, the map has changed the names of 361 stations to celebrate Olympic athletes. “There were heated debates and a few late changes of heart, but we are happy with the result: dozens of nations represented, all 2012 Olympic sports accounted for, and Ali and Phelps, two of the greatest Olympians of all time, guarding the Stratford gateways to the games,” map designers Alex Trickett and David Brooks said in a joint statement. Phelps, who won a record eight gold medals in swimming at the 2008 Beijing Games and has 14 overall, gets the honor of being the main Olympic stop, which is usually known as Stratford. The nearby Stratford International station on the Docklands Light Railway is named Cassius Clay, the original moniker of boxing great Muhammad Ali, winner of the heavyweight gold at the 1960 Rome Olympics. The new map brings in famous Olympians from a variety of sports, including 2008 men’s tennis singles gold medalist Rafael Nadal, gymnastics great Nadia Comaneci, five-time Tour de France champion Miguel Indurain and 1992 Dream Team players Michael Jordan and Larry Bird. “The map not only celebrates multiple gold medal winning athletes but also features other extraordinary athletes who may not have won an Olympic gold medal but are recognized for their abilities or in some cases, famous defeats,” the TFL said. Track stars make up a good part of the map, running from west to east and all around the center of the city with “Sebastian Coe,” ”Maria Mutola” and “Emil Zatopek,” the all-time greats are represented. Boxers take up another hunk of the map, with “Laszlo Papp” soon giving way to “Teofilo Stevenson” and eventually “Sugar Ray Leonard” and “Floyd Patterson.” ”Mia Hamm,” a gold-medal winning soccer player for the United States, is the new name for the Picadilly Circus stop right in the middle of the city. Baker Street is renamed “Daley Thompson,” the two-time decathlon gold medalist. Some of the non-winning representatives include both Zola Budd and Mary Decker, the runners who got tangled in the 3,000-meter final at the 1984 Los Angeles Games. We can’t see any Irish selections from our examination of a sample map. Email “Next stop, Muhammad Ali: London Underground map gets Olympic facelift”. Feedback on “Next stop, Muhammad Ali: London Underground map gets Olympic facelift”.